On Saturday, May 27, thousands of overjoyed Scientologists gather in central Copenhagen where the city’s most famous squares converge, to celebrate the triumphant grand opening of the new Church of Scientology Denmark. 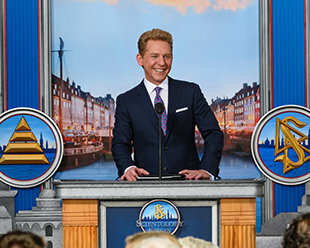 Mr. David Miscavige, Chairman of the Board Religious Technology Center, presides over the jubilant celebration of Denmark’s new Church of Scientology in the historic heart of Copenhagen. Time and again during Mr. Miscavige’s keynote address, the exuberant crowd rises to its feet in joyful recognition of a historic day for Copenhagen and all of Denmark. Joined by two dozen Scientologists who were at the vanguard of bringing the new Church to life, Mr. Miscavige dedicates the city’s stunning Church of Scientology. Cheers reverberate around the square as a new era dawns for Danish Scientologists with the grand opening of their breathtaking Church. A rousing rendition of Hans Christian Andersen’s “In Denmark I was Born” set the tone for a resplendent dedication ceremony in the cultural center of Copenhagen. Mr. David Miscavige with (left to right): Mr. Rene Jensen, Publishing Executive and Advisor to the Copenhagen Commune; Mr. Bjarke Christensen, Historic Restoration Architect; Mr. Klaus Mygind, Copenhagen City Councilor; and Mr. Thøger Berg Nielsen, Chief Superintendent for the Danish Police (Ret.). With the fall of the ribbon, the ecstatic crowd surges forward to behold the city’s enchanting new Church of Scientology. THE HISTORY OF NYTORV 11-13The landmark Neoclassical townhouse at Nytorv 11-13, today home to the Church of Scientology, was originally constructed in 1796. Throughout its history, the building has served a variety of uses: a paper factory, warehouse, brewery and café. The site further served as a private residence, and was home to a number of prominent Danes, including the king of Nordic poetry and author of the national anthem, Adam Oehlenschläger. Carl Christian Hall, a member of the original Constitutional Assembly and 32-year member of the National Assembly, lived here before going on to serve as Prime Minister in the mid-19th century. After acquiring Nytorv 11-13, the Church brought new life to the landmark, which included restoring and preserving the original wood staircase built in 1885. Now dedicated as the home of the Church of Scientology, the building remains a significant tribute to the past and a herald of the future for Denmark. From the opening notes of Hans Christian Andersen’s “In Denmark I was Born,” the thousands present witnessed a grand opening ceremony of both national tradition and a sense of wonder. Dignitaries on hand enlivened the occasion with tales of humanitarian partnerships for a greater Denmark, of adventure where the treasure is knowledge to be shared with all and with a recognition of a historic landmark now magically transformed back to life. The Church redesigned, restored and renewed its new home in central Copenhagen. At 40,000 square feet, this Neoclassical building was originally constructed in 1796 and was born out of the flames of the “Great Fire” just one year prior that had consumed the Nytorv/Gammeltorv district. In fact, city planning mandated the building’s distinctive “broken corner” façade to allow long-ladder fire engines access to the city’s narrow streets. With craft and care, the Church teamed with local artisans and returned to the landmark its original character. Denmark is world famous for its design and craftsmen and the work included the restoration of the original oak window casements and bay doors on its exterior and the wooden staircase and vaulted arch ceiling inside. Denmark’s new Church of Scientology stands five-stories tall and just steps from the Strøget, where 75,000 pedestrians pass by every day. As such, it serves as a central city hub for a number of humanitarian initiatives that have earned the respect of Copenhagen’s civic community. For three decades, Church-sponsored drug education groups have reached out to the country’s youth with hundreds of thousands of copies of The Truth About Drugs booklets; The Way to Happiness organization has held neighborhood cleanups and blanketed Copenhagen streets with the commonsense nonreligious code for moral living written by L. Ron Hubbard; all while the local chapter of Youth for Human Rights has worked to uphold their national heritage by creating an annual “Awareness March” and overall reaching more than two hundred thousand with their human rights message. City and national dignitaries honored the benevolent spirit of the occasion in welcoming the Church: Copenhagen City Councilor, Mr. Klaus Mygind; Chief Superintendent for the Danish Police (Ret. ), Mr. Thøger Berg Nielsen; publishing executive and advisor to the Copenhagen Commune, Mr. Rene Jensen; and Historic Restoration Architect, Mr. Bjarke Christensen. The Information Center also details the many humanitarian programs that Scientology supports. They include a worldwide human rights education initiative; a far-reaching drug education, prevention and rehabilitation program; a global network of literacy and learning centers; and the Scientology Volunteer Minister program, which has become the world’s largest independent relief force. The Chapel is housed in a spacious four-story atrium with natural light from the skylight ceiling casting a graceful glow throughout. It will host community-wide events, open to members of all denominations. The facility further includes multiple seminar rooms and classrooms, and an entire floor dedicated to Scientology auditing (spiritual counseling). The Denmark ribbon cutting is yet another accomplishment in an outstanding 12 months of growth for the Church. Recent openings have taken place in Miami, Florida; San Fernando Valley, California; Auckland, New Zealand; San Diego, California; Sydney, Australia; Harlem, New York; Budapest, Hungary; and Atlanta, Georgia. Future openings are slated for cultural epicenters in Latin America, North America, Europe, the United Kingdom and Africa.